The Mediterranean blue skies, emerald landscapes shimmering in the April sunshine, the crisp cool breeze of early spring – the 45 minute drive from the Venice Marco Polo International Airport to Vicenza was relaxing; more so aboard the spacious Mercedes Sprinter chauffeured by the tiny and efficient Giovanna of the elfin charm. Our next few days exploring the various towns of Vicenza, Verona, Padova, Treviso, Bassano del Grappa, in the Vicenza province, were perfect. This here was the perfect holiday destination for thesophisticated traveller. Vicenza Province lies to the North East of Italy, in the Veneto region. Set at the confluence of the two rivers Retrone and Bacchiglione, and with the Berici Hills forming the backdrop in the South, the varying landscape is of great beauty with its hills and dales and water ways, hot water springs, undulating expanse of vineyards, sunshine yellow expanse of Brassica Napus or Rapeseed, and the glorious well-preserved Palladio’s architectural landmarks that herald its history dating back to pre Roman times. Vicenza Province offers the perfect eclectic mix of engagements for aromantic, luxurious vacation. The region is not overrun by tourists unlike Venice and Rome. A rich offering of history and culture, as there are well preserved palatial villas, castles, forts, glorious churches, gardens, canals. There are several local fairs and festivals spread through the year. 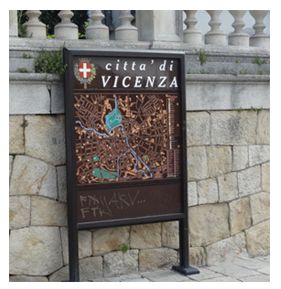 Tourist friendly with a proactive Vicenza tourism board, which offers easy-to-read maps and guides for bicycle tours, walking tours, makes available bilingual trained guides. A world class golf course is a cherry on the cake. It is a Gastronome’s paradise. A very exciting culinary destination, even for vegetarians, and offers the world’s best wines and cheese and ice-creams and more. Mobility is easy with the availability of radio taxi service, which is prompt, safe and friendly, and options for rent-a-car or chauffeured vehicles. 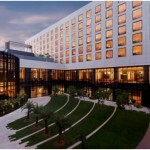 There is an amazing range of boutique luxury hotels, some with concierge service. The region is safe for tourists, even single women. Venice’s Marco Polo international airport is close by. High speed trains provide easy connectivity with Rome, Milan, and Florence just a few hours away. For the Indian tourists, Turkish Airline flies daily to Vicenza, and to all of nine destinations within Italy. Their business class is on par, with flat beds and on-board-chefs, and the VIP lounge at Istanbul is excellent. For private jets, barely 20 km from Vicenza there is a small airport at Thiene. Helicopter rides are available from private operators. The entire province is beautiful. We visited these five towns of VICENZA, VERONA, PADUA, TREVISO, BASSANO DEL GRAPPA, each within an hour of one-another, yet each with a distinct characteristic. Our feature on each of the other towns will be appearing back to back. Set in the lowlands of the Berici hills, Vicenza is a work of art, with grand buildings and other architectural landmarks indicative of its place in history thousands of years ago. The footprints are everywhere, from the Roman times dated 49 BC (the Criptoportico, mosaic floors, bridges, the Lobia aqueduct, the Berga theatre), to the mid sixteenth century, when Andrea Palladio, the famous architect made Vicneza his home. His magnificent villas earned Vicenza the title of Pearl of Renaissance, and his style influenced architects across Europe and rest of the world, known as the Palladian style of architecture. 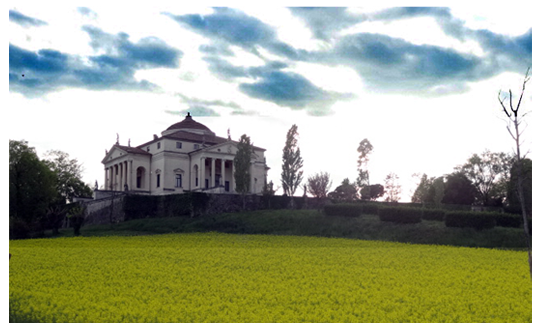 All these villas around Vicenza and the city itself are now declared UNESCO World Heritage site. It would be hard to believe that the gentle, pristine vistas of Vicenza took a sever pounding during the World War II from the Allied forces. Careful restoration work has removed all the scars. At the heart of the city, to the south of Piazza dei Signori is the Basilica Palladiana, its green dome roof made by Palladio has become the symbol of the city. 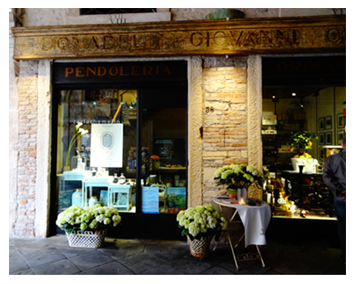 Age old jewellery shops are still housed under the Basilica, with their centuries old signage restored. A great place to hang out in good weather, the wide open expanse of the Piazza dei Signori, surrounded by handsome buildings (all with a story to tell of their past), lends itself well to the relaxing sport of people watching, feeding pigeons, sipping wine at the several eateries and restaurants in the area, which set out chairs in the open. At the onset of spring, the place comes alive with open markets that appear on Tuesdays and Thursdays for the first half of the day. 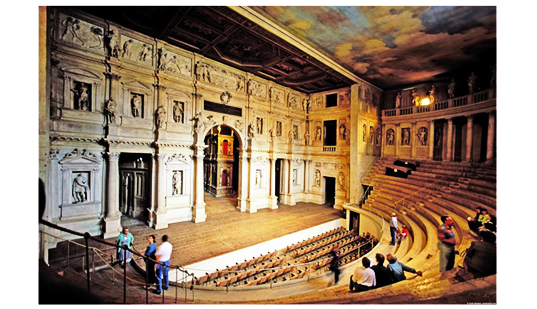 Palladio’s last famous work, the 500 years old Greco-Roman Teatro Olimpico, which was the first purpose-built theatre in Europe in over a thousand years, is well preserved. It is shut down in winters, to protect the interiors from the damaging effects of artificial heating. Recommend to purchase headsets or hire a guide to know all about it. 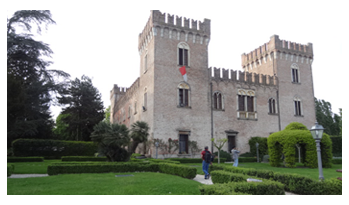 A half-day city walk tour through the old city Vicenza, along its cobbled pathways, narrow alleys, starts with the old Scaliger Castle at Piazza del Castello. The other prominent grand structures such as the Palazzo Valmarana Braga Rosa and the church San Lorenzo, deserve a visit. Not possible to miss are Palazzo Chiericati, Casa Cogollo, Cupola e Porta della Cattedrale, and other works of Palladio. 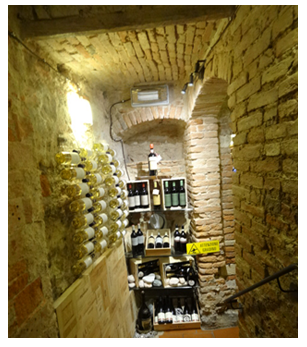 Perfect lunch destination recommendation – il Ceppo, a deli with a bistro in their wine cellar underground, cheese platter with wine tastings, try the Polenta e Sopressa, Bis d Lasagne; it is not far from the Basilica Palladiana. For after hours, check out the bar and restaurant Bar Borsa, which has live music performances indoors. Bar Borsa is located in Piazza dei Signori, under the Basilica Palladiana. The annual Vicenza Jazz Festival takes place in May, across the town at different venues. The very picturesque Golf Club Colli Berici, 12 kms from Vicenza, located 300 metres above sea level, between the hills of Brendola and Altavilla, offers a grand stand view of the little Dolomites, and an 18 hole golf course, with 5.1 km courses, spread across an area of 58 acres. 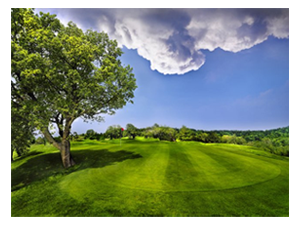 There is the Golf Academy with golf pros who train and guide, a gourmet restaurant, options to go riding, trekking, cycling or Nordic walking on woodland trails. They also have the facilities to host corporate conferences, weddings, and such. 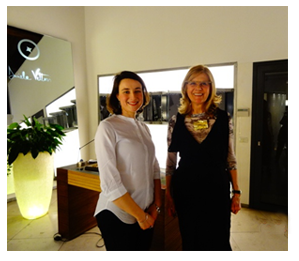 We give our thumbs-up to the Trattoria Molin Vecioexperience. 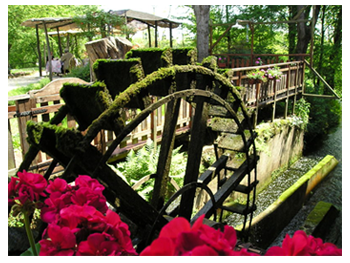 This amazing eatery is set in an old water mill from 1520. With their own herb garden, orchards, the freshest food, aperitifs, house wines, they also organize cooking classes / wine and theme nights. On June 6 is the Feast of Herbs and Edible Flowers, October will be the Feast of Forgotten Fruits. That sounds interesting! In the heart of Vicenza is the boutique hotel Relais Santa Corona, set in an 18th Century structure. A hotel with oomph and pizzazz is the Glam Boutique Hotel, where the fashion houses and film production houses like to celebrate. A short drive away from Vicenza, in a rustic setting, is the Hotel Villa Michael Angelo, with a grand stand view of the hills, and clear blue skies. This stately mansion was originally the home of the Tomi family of Vicenza, and was built in 1700. It has a five star view, swimming pools operational in summers, lovely gardens just right for a wedding, spacious room and more. Most hotels offer free Wi-Fi, but the signals are pretty ineffective. 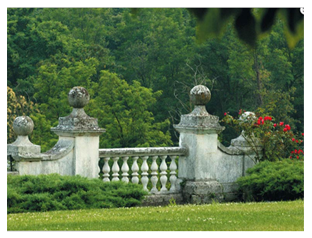 There are other stay options available in and around Vicenza.